Earlier today, Deadline confirmed that deals are close for the initial cast of their new heist movie Ocean's 8, directed by Gary Ross (The Hunger Games and Free State of Jones). Big names in announcement include Oscar winners Sandra Bullock, Cate Blanchett, and Anne Hathaway as well as notable names like Helena Bonham-Carter and Rihanna. While the all-female principal cast of this traditionally male-centric franchise might have most people's attention, we were intrigued by two familiar names in the announcement. 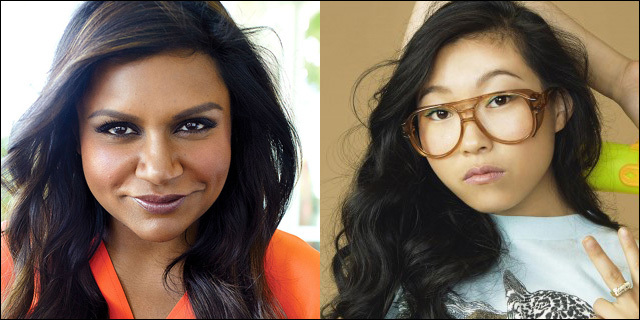 Major roles in the film has been offered to Asian American actors Mindy Kaling and Nora Lum (aka Awkwafina). Mindy Kaling is an actor, screenwriter, and author, who came to prominence as Kelly Kapoor in NBC's hit show The Office where she also worked as a writer. Currently she's one of TV's precious few Asian American leads on her romantic comedy television series The Mindy Project. Nora Lum, better known by her stage name Awkwafina, is a New York based rapper recently featured in the documentary Bad Rap. In addition to blowing up the stage and the internet every time she performs, she's also been making strides as an actor, recently appearing in the film Neighbors 2. No word yet on what roles the two will play in the ensemble cast, but chances are they will be part of the crew assembled around leads Sandra Bullock and Cate Blanchett to pull off some impossible caper. The only Asian member of George Clooney's Ocean's Eleven trilogy was Chinese acrobat Qin Shaobo, who served as the crew's slippery greaseman, who's job was getting in and out of tight situations. While it's unlikely that Kaling or Lum will be taking up Qin's mantle, it'll be interesting to see what characters they end up playing. The best part of heist films is watching each character have their moment of expertise and it's going to be awesome to see these ladies con, sneak, hack,or even blow up their way into their objective. Marvin Yueh is the managing editor of the Kollaboration Blog and the host of the KollabCast. This post was originally published at Kollaboration.